As Michigan State University’s (MSU) connection with Michigan residents, MSU Extension professionals are increasingly engaged in conversations about genetically modified organisms (GMOs). But in a survey conducted by our program evaluation specialist Cheryl Eschbach, only 37 percent of Extension survey respondents felt capable of replying to GMO-related questions with science-based information, and only 1 percent felt extremely capable. Recognizing a need, Ron Bates, Agriculture and Agribusiness Institute (AABI) director, brought together a cross-institute committee to develop a training for MSU Extension professionals. The result was a two-day training, “Getting your GMO Questions Answered 101,” offered January 8-9, 2018. MSU faculty and Extension professionals shared presentations on research and technology as well as communicating with clientele about GMOs with over 100 Extension staff members. “The GMO workshop increased my understanding, and that will help me to confidently answer consumer questions about GMO foods that arise during my food safety programs,” MSU Extension health and nutrition educator Beth Waitrovich said. Ron Goldy, MSU Extension agriculture and agribusiness educator and event committee chair, felt the event was successful in opening up dialogue and providing tools to talk to MSU Extension clientele, especially during the interactive activities. This workshop was designed to be the first of many opportunities to provide MSU Extension professionals with resources and to open up dialogues. Additionally, the committee is working on creating an online space to make the documents and presentations from the workshop available to all Extension employees. I would like to thank the team of people who made the event possible: Ron Bates, Betsy Braid, Erin Carter, Julia Darnton, James DeDecker, Mary Dunckel, Cheryl Eschbach, Theodore Ferris, Elizabeth Ferry, Ron Goldy, Rebecca Grumet, Courtney Hollender, Rebecca Krans, Joyce McGarry, George Silva, Lisa Treiber, Kendra Wills and Garrett Ziegler. I’d also like to thank all of the speakers and presenters throughout the event. It may not feel like it with the months of freezing temperatures we’ve been experiencing in Michigan, but spring is coming soon! If you’re going to be starting a garden, you may be interested to hear about the Smart Gardening initiative, which started in 2013 and will continue to promote science-based gardening, environmental awareness and sustainability to home gardeners across the state. The Smart Gardening initiative began when the consumer horticulture team realized that home gardeners were missing some simple but extremely helpful advice. The team worked with communicators Joy Landis and Mallory Fournier to develop resources for repetitive, consistent use of a small number of concise messages. They labeled messages they developed as Smart Lawns, Smart Plants and Smart Soils. The team includes Rebecca Finneran, Rebecca Krans, Mary Wilson, Gretchen Voyle, Mary Gerstenberger, Karen Burke, Carol Lenchek, Bob Bricault, Diane Brown-Rytlewski, Elise Carolan, Linda Whitlock and Hal Hudson. 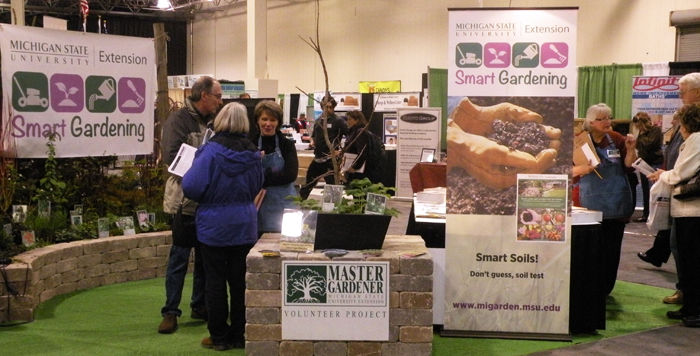 The Smart Gardening concepts are used in multiple ways across the Gardening in Michigan website, as well as other media sources, but the key to launching these messages is promoting them at booths at gardening shows across the state. The consumer horticulture team recruits Master Gardeners to work in the exhibit displays. The Master Gardeners engage people strolling by, share the messages and collect demographics and topics of interest from anyone viewing the display. Other educational opportunities are also presented by experts. Michigan State University (MSU) Extension news articles regularly feature the smart messages as well. Smart Gardening events have reached a diverse audience by interacting with rural and urban audiences through events across the state; these public events drew people from more than 50 of Michigan’s 83 counties and two surrounding states. In addition, we’ve seen increased use of MSU Extension resources such as the Gardening in Michigan website and MSU soil test kits since the implementation of this program. Great work from the consumer horticulture team! Many of our Michigan State University Extension colleagues will attend the Association of Communication Excellence (ACE) Conference in Portland, Oregon, June 24-27. And once again, many will be presented with ACE awards they have received. A team from Agriculture and Natural Resources (ANR) Communications and ANR Technology Services received a silver award in the website category for our own MSU Extension website. Winners include Dennis Bond, Sean Corp, Michelle Lavra and Beth Stuever. A silver award for a marketing communications campaign went to a team who worked together on the Smart Gardening Initiative. The team included Joy Landis, Mallory Fournier, Rebecca Finneran and Mary Wilson. The recipients developed a process for the Consumer Horticulture team to market Smart Gardening advice and expertise to reach a large number of Michigan gardeners. Additional staff who lend their expertise, time and effort to Smart Gardening include MSU Extension educators Bob Bricault, Diane Brown, Hal Hudson, Rebecca Krans and Gretchen Voyle. Entomology Professor Dave Smitley has also helped build the basis for the initiative. In addition, a team from ANR Communications will be presenting at the conference. Sean Corp, Katie Gervasi, Mindy Pratt, Paula Sheynerman and Beth Stuever will present “Promoting Extension: They Come for the News: They Stay for the Programming” Wednesday, June 25 at 4:15 p.m.
Also, the Smart Gardening team of Joy Landis, Mallory Fournier, Rebecca Finneran and Mary Wilson will present “How a Message Campaign Produced a Team to Deliver Smart Gardening to a Smart Audience” Wednesday, June 25 at 11 a.m. In our roles at Michigan State University Extension, we might spend many hours preparing a presentation or workshop with specific objectives in mind expecting that participants will grasp the intended educational concept or skill. Sometimes, we have the unexpected pleasure of participants gaining even more than what we’ve planned for. That’s what happened at the 4-H Visual Arts and Crafts Workshop that took place at the Kettunen Center in Tustin, Mich., Oct. 12-13. Surprisingly, it happened because of what most of us would consider an unfortunate situation. The hands-on aspect of visual arts makes it a good vehicle to teach life skills. The workshop participants (4-H volunteers aged 12 and up) learn to serve as role models when they’ll teach and help process these same activities, connecting the 4-H members they work with to life skills used in science, entrepreneurship and leadership. 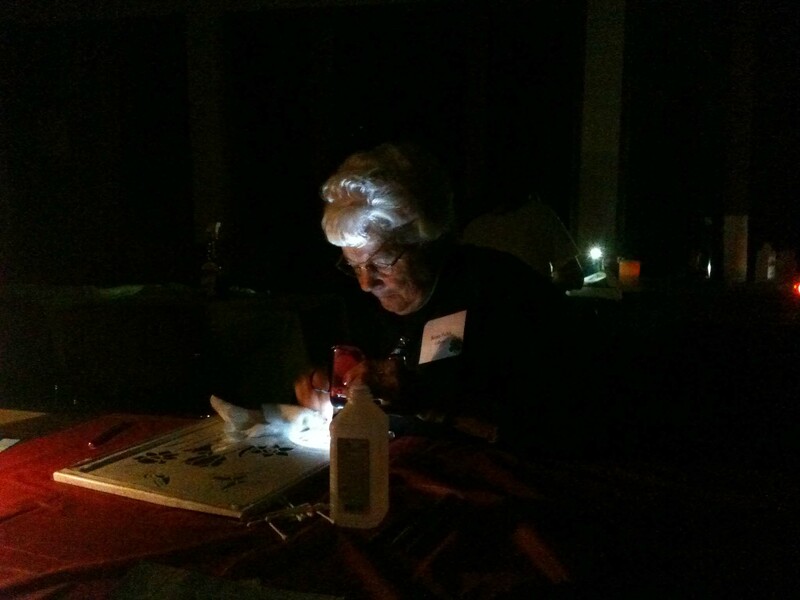 However, when a transformer blew and the power went out for almost five hours, participants practiced some life skills not in the lesson plan that day. As participants continued to work on their projects in the dark, both staff and participants practiced resiliency, teamwork and patience. Kettunen Center staff members brought in candles and lanterns, and participants used their flashlights to finish their projects. The planned hot meal was no longer possible, so Kettunen Center staff rose to the challenge, serving a cold-cut buffet with trimmings. Three work groups collaborated to plan this workshop including Leadership and Civic Engagement, Career Exploration/Workforce Preparation and Academic Success. Senior Extension educator Nancy Victorson chaired the workshop while Jan Brinn, Sara Keinath, Rebecca Krans, Connie Lange, Bev Przystas, Dave Radloff and Laurie Rivetto served on the committee. All committee members facilitated portions of the workshop and pitched in to make things work when the lights went out. Other staff members who taught were Catarina Edison and Cheryl Powell.